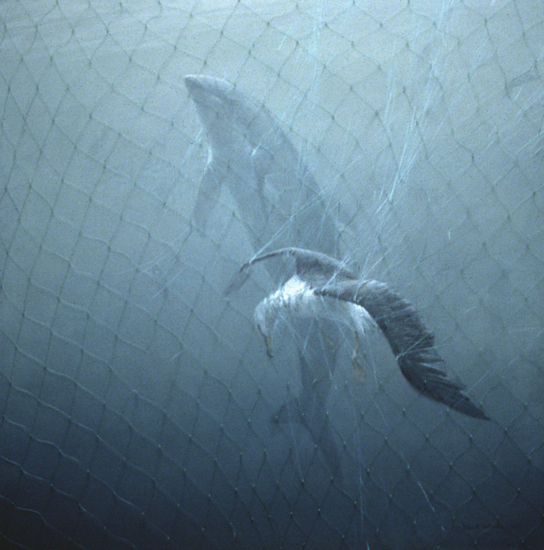 During the 1980's, it was estimated that thirty-one thousand miles of driftnets were set each night in the Pacific. These drifting "walls of death" captured untold numbers of dolphins, whales, pelagic birds (birds of the open ocean), sharks and turtles, along with the targeted species. Thanks to a recent United Nations moratorium on driftnet fishing, this highly destructive activity has been sharply curtailed in the Pacific, though it remains a common practice in the Mediterranean. But the underlying problem of wasteful over fishing remains. In every sea and ocean of the world, the commercial fisheries are either at or over their sustainable limit. And the shocking proportion of what is caught is discarded. Conservative estimates put this "bycatch" at 20 percent of the total commercial catch. The plight of the world's fisheries is symbolic of a much wider and more vexing problem: the industrialization of what were for many thousands of years such essentially sustainable activities of farming, forestry and fishing. Instead of treating nature with respect, we now treat it as a value-neutral commodity. Massive sums are borrowed and invested in large-scale technology, which must be constantly fed raw material in the form of crops, trees or fish in order to pay the interest on the original loans. When the "resource base" inevitably collapses, so do the economies that depend on it. It's a vicious cycle that ends in the devastation of ecosystems and the impoverishment of the planet.